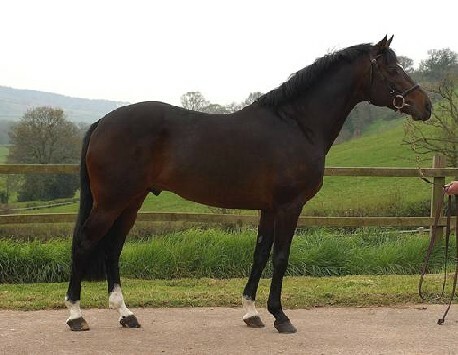 Primmores Pioneer is a dark brown 3/4 thoroughbred, foaled in 1995 and standing 16 hands 2”. His sire is Mark Todd's Mayhill and his dam is Primmore Hill by Ben Faerie. He is full brother to Badminton, Burghley & Lexington winner Primmore's Pride and an advanced and approved stallion in his own right. Two of his progeny can be seen in the following photos. Primmores Pioneer is standing with Mr & Mrs Bleekman at Whorridge Farm in Devon, UK. Thankyou to Denise & Roger Lincoln for for allowing me to display this photo of their superb stallion.